In the Jardine's Hill Country Peach Salsa , when the winters are not too long and summers are not too dry, the local peaches are harvested in abundance. In one such year, a surprising flavorful salsa was created, Jardine's Hill Country Peach Salsa. Juicy sweet peaches were combined with sun-ripened tomatoes and a hint of jalapeno pepper to make a salsa that ignites all the taste buds in your mouth. 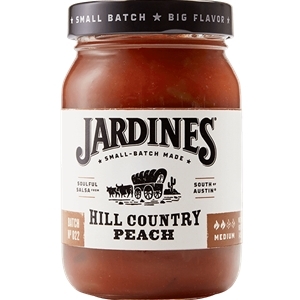 Now the flavor of Jardine's Hill Country Peach Salsa has become a nationwide sensation. Check out all of our tasty Peach Salsas. Tomato, peach, water, tomato paste, onion, brown sugar, distilled vinegar, jalapeno pepper (jalapeno pepper, vinegar, salt and acetic acid), green chiles, salt, green bell pepper, dehydrated garlic, spice and xanthan gum (natural thickener).